I like clever songs. Silly songs. Novelty songs. I’ve attempted to write many such songs. I believe making someone laugh is one of the most important things you can do in life. But at some point in the last few years, sitting at the piano to pull together a new song began to feel weighty. If we were going to perform it night after night, it felt essential that each song mean something. 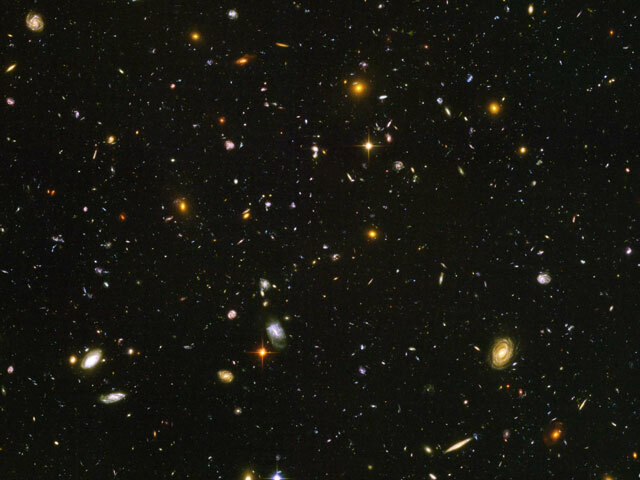 Take a look at this Hubble ultra deep field photo. To the naked eye, that patch of sky is a void between visible stars, one tiny patch of black in the sky, but when you look closer you find countless worlds. This is the world we live in. How can that not affect your views? Yet it’s difficult to find songs that express this. That’s the realization that struck while I was struggling with a song about the more harmful branches of pseudoscience (the anti-vaccination movement in particular). I’d hoped to write something clever, but it was hard to shake off my rage and keep it light. On my coffee table was a copy of Carl Sagan and Ann Druyan’s The Demon-Haunted World: Science as a Candle in the Dark. It made me think about the great statement attributed to Sagan (though apparently unsourced): “Somewhere, something incredible is waiting to be known.” I decided I was having trouble because I wasn’t saying what I meant: that the world is far more interesting and worthy of exploration than most of the drama we invent. Here’s an mp3 of us playing it live on WDVX’s Blue Plate Special back in March. The lyrics are below. We’ve been playing “Sound” live since December, but we’re still polishing it. I hope you enjoy this take, and maybe some day we’ll have a studio version. Thanks for reading this. I hope to write more song explications like this as we begin to work them into the live set and make demos. The starry seas, the tidal leaves parley together. Through peaceful eves or stormy weather. Pull on your heartstrings so much greater? And great unknowns are lost. Will leave you trembling, pale. When you let go of the stale.